Thanksgiving Sharing is one of our oldest and most treasured social action ministries at Saint Luke. Our Commission helps those less fortunate by preparing and delivering 180 baskets of food, including a turkey and "all the trimmings." We Need Your Help. It takes over 200 parishioners to organize, build the baskets, and deliver them to those in need. Interested in joining our group? Just click here! Interested in purchasing a basket for a family in need? Our cost for a basket this year is $40, but you can donate any amount you would like. It's really easy to do. Just click here to buy a basket. 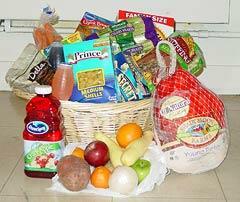 Baskets will be "built" on Sunday, November 20, and distributed on Tuesday, November 22, from 3 PM until 6:30 PM. For more information, please contact the coordinator, Denise Purdie-Andrews. 27 Years of Thanksgiving Service to the Needed of our City!